CDC released their Vital Signs earlier this month that focused on physical activity and disability which revealed some alarming facts about the amount of activity that individuals with disabilities receive. The data showed that half of individuals with disabilities get no physical activity at all (compared to 1 in 4 for individuals without a disability). No physical activity leads to other health-related issues such as obesity, heart disease, stroke and diabetes – which individuals with disabilities are three times more likely to have. Changes need to be made to relay the importance of being physically active and alterations to existing programs need to occur so that individuals with disabilities have more options to physical activities that they enjoy. The CDC states that there are more than 21 million Americans in the US that identify as having a disability. While the range of ability for these individuals varies significantly, a lot of these individuals are capable of being physically active on some level. It is recommended that individuals exercise two and a half hours a week, which breaks down to about 30 minutes of activity 5 days a week. However, any activity is better than none, so even if it’s just a 1o minute walk it still counts for something. If the individual hasn’t done any physical activity at all prior to this, 10 minutes may also be as long as they can go. Starting slowly and building up gradually over time is essential to help prevent injuries or discouraging individuals with an activity that is too difficult in the beginning. The Arc’s HealthMeet project has taken steps to help improve the current situation by training caregivers and other direct service professionals in the HealthMatters program. HealthMatters is an evidence-based health and fitness curriculum developed by the University of Illinois at Chicago (UIC) that is tailored specifically for individuals with disabilities. It provides the structure and materials to implement a 12 week health and fitness program. Each session focuses on a healthy lesson for the day, such as making sure to drink water while exercising or the importance of stretching before/after exercising, etc., and then spends the other half of the time doing a fitness activity. Activities can be done inside or outside and require little equipment so it’s easy to implement and get started without the need for expensive machines and equipment. Through HealthMeet, The Arc has certified 76 new trainers from 38 different Chapters of The Arc and other disability organizations across the US. HealthMatters has been implemented in a variety of different ways that suit each communities needs best, whether it’s in a day/residential program, combined with the HealthMeet project’s free health assessments, or brought into local schools special education programs. 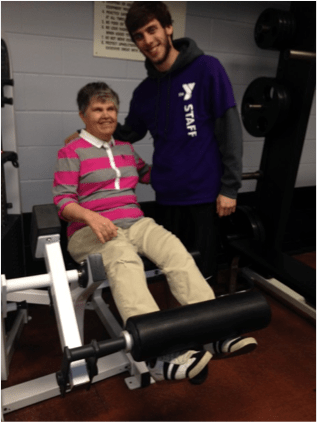 A few of The Arc’s Chapters have paired the lessons with field trips to local grocery stores to learn about eating healthy or to The Y to learn about using the different weight lifting machines and partake in water aerobics in their pool. These field trips not only were fun and educational for the participants it also got them out in their community and allowed employees that worked at the local establishments a chance to interact and learn more about our population, which they might have had little experience with beforehand. In addition to getting these individuals up and moving on a weekly basis and helping them to learn more about making healthier choices, the HealthMatters program also improves social skills and helps build self-esteem. It gives participants a chance to interact and be part of a group. It also helps them find individuals that might have similar interests that they can be active with. This entry was posted in Programs and Supports and tagged HealthMatters, HealthMeet, Vital Signs. Bookmark the permalink.